A cancer survivor weighs his losses and gains. I’ll start with the obvious. I gave up my left breast and a couple of lymph nodes. I gave up my normal-looking, proportionately balanced chest. And I gave up the image I once had of myself, the vision of me as a healthy, active, marathon-running, mountain-climbing guy. Cancer made me give all that up. I also gave up the idea of ever feeling totally safe from cancer’s claws. No matter how long I live from this moment forward, the thought of recurrence will always be lurking in the shadows. I’ve given up any thought of not being branded by insurance companies as a guy with a pre-existing condition. And after three years cancer-free, I have finally given up the hope of ever getting the feeling back under my left arm – the place where so many nerves were cut in order to remove my cancerous breast. The list is even longer, but the point is that cancer takes away parts of our lives that can never be recovered. But as survivors, we eventually learn to roll with the punches that a cancer diagnosis delivers. And in the act of writing down these things that I believe cancer has taken from me, it has become apparent that, except for the physical elements, much of what I’ve listed are just my thoughts about cancer. Many of those concerns and worries that follow us are simply phantoms of fear, murky notions that are made real by our inability to see into the future. There is a remedy I’ve found and it’s available to all of us. 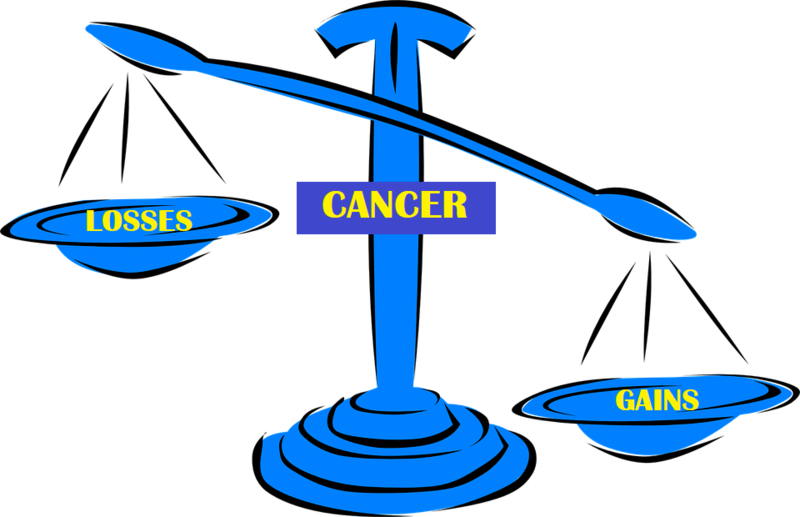 It’s as simple as turning the cancer equation upside down, or right-side up, if you prefer. And so I instead of asking myself the question “What have I given up for cancer” I ask, “What have I gained from my disease”? Interestingly, I find the list to be far more impressive than I ever thought possible. Cancer has given me a new relationship with life. I now value each and every day in which I have one more chance to discover a bit of awareness about myself and of the world we live in. I have one more chance to recognize the intricacies of thought and how our fears and assumptions can create a sickness of their own. Cancer has given me an opportunity to finely focus my hope for a meaningful and fulfilling life, and the ability to put aside the unimportant stuff I’ve dragged around for too many years. And it has given me a penchant for things that may be simple, but resonate with a sense of purpose. Cancer has shown me who my true friends are, and how important an honest conversation with someone can be. And cancer has given me a resilience that I never knew existed within me, as well as ability to push on and pull through. I’ve found that it’s often easy to point to some external cause of our pain and misfortune and say, “You did this to me.” But as I accept the fact that human disease is part of the human experience, it clears the way for me to focus on positive ways to combat it head to head, rather than as some invisible enemy. The reward for acknowledging those sometimes hidden gifts in our lives that are obscured by our misfortunes is often an empowered life plan and a renewal of spirit, both of which may offer another dimension in our crusade against cancer.